Properly Light Your Yard: Those who rob homes depend on and target houses with poor lighting. The judicious use of floods, bullets and motion-detected lights will significantly improve the security of your home. Do Not Create Hidden Areas: It should seem obvious but many people plant large bushes and even trees that block views and create places where someone could infiltrate a home. Instead use low bushes for the best effect and enhanced visibility. 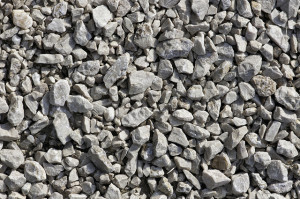 Add Gravel Near Entry Points: Sound clues are equally valuable when securing your yard. Use gravel around the home. Not only does it look good but also signals the approach of anyone near the house. For more information on this and other landscaping topics, please visit us online at OutdoorExpressions.net or, if you are in need of a commercial landscaping firm in Atlanta, please call us directly at 888-210-1116. Outdoor Expressions – Making your outdoor space a place to remember. Fashioning a space for entertainment lets you take advantage of warmer weather. Setting up an outdoor dining area with a grill station or fire pit brings people together. Whether soaking up the sun or basking in moonlight, your landscape can be popular and coveted. Good lighting sets the mood for astounding landscapes. Make sure the glow suits the intention of the space. It’s amazing how ‘watering down’ will spruce up a landscape. Adding aquatic features to your yard dramatically improves curb appeal and enjoyment. Soothing fountains and cascading waterfalls evoke peace and tranquility in landscapes. Who wouldn’t want to luxuriate in that? Are you looking for creative and exciting ideas about landscaping in Atlanta? Just contact us at Outdoor Expressions – Making your outdoor space a place to remember. When planning your hardscape construction in Atlanta, be sure to consider the types of stone you want to employ, both for their aesthetic and utilitarian traits. Knowing the details of stone quality before planning can give you the edge up while designing a new hardscape. Due to the recent heavy rains in Georgia, avoid using flagstone which is known to get slippery when wet. Slate is a much more water-resistant option that also carries a classic appearance suitable for many applications. For something more dazzling, sandstone and quartzite tend to glow in the moonlight. Along with granite and limestone, all of these options are available in a wide range of color choices to best match your overall motif. 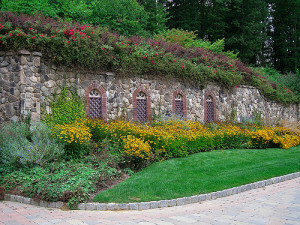 To keep things formal, consider large, square-cut, pieces of stone for the walkway. Natural stone seems more wild and artistic. To tie together your hardscape design with a garden area, colored gravel can be used as mulch. This also adds a modern, polished, appearance to the entire space. For more help with your hardscape construction in Atlanta, please contact us at Outdoor Expressions today. Whether the walkways to your business go through a garden space or just cross the grass, properly edging them is an essential aspect of landscape maintenance that can’t be overlooked. Without solid edges, the grass will slowly grow over any concrete or paved walkway, causing an unsightly path, additional work, and a potential safety hazard. Edging can be constructed from various materials, such as wood, brick, plastic, or concrete. 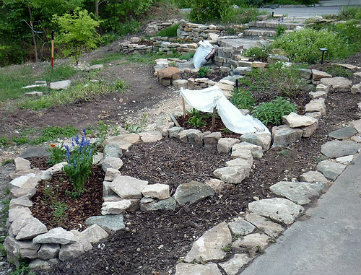 A basic edge can be built from simple trenches along the path, though this, too, will eventually be covered in overgrown grass. One tactic to edging is to employ mulch, but this is more intended for along flowerbeds and other garden areas. When you have garden edging along your paths, you’ll be able to enjoy a more beautiful and safe walk, as well as know that new and old customers alike are getting the best impression possible while approaching your company. What’s more, how embarrassing would it be for someone to trip on overgrown grass or weeds obstructing your sidewalk? If you’re concerned about your landscape maintenance and want to hire a professional for a consultation, please contact us at Outdoor Expressions today! While looking for a commercial landscaping firm in Atlanta, you need to know about the fundamentals of landscaping. 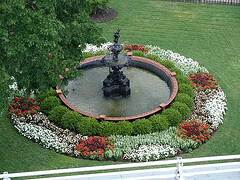 Here is how “Formal Landscaping” can help transform the image of your home or business. Simple geometry: Formal Landscaping has its roots in Greek and Roman angles. It emphasizes the use of right angles, straight lines, and circles to achieve symmetry. Proportion: It all comes down to proportion, and your landscaping firm should keep the golden ratio and the Fibonacci series in mind. Design along the axis: Much of Formal Design depends on bilateral symmetry, which basically means that all shapes are equal size and placed opposite one another. Cohesion: Repeating motifs around a garden will help you bring cohesion to your garden, much like a puzzle when complete. Good foundations: The fences, evergreen plants, paths, patios, and walls are parts of your garden that will be noticed year-round, making them one of the most important aspects of your design. Feel free to contact us at Outdoor Expressions to see how we can help you achieve your dream landscape. 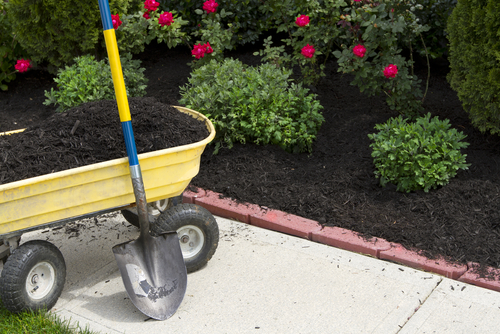 Applying mulch is a regular part of landscape maintenance. It helps keep the soil moist, slows weed growth, and can even provide your plants with organic nutrition as they grow. Not all mulch is created equal, however. There are many different varieties, and the key is choosing the one that’s the best for your garden’s health. Gravel is a good choice for succulents since it absorbs heat. If you use it with any other kind of plant, you’re likely to cause overheating and scorch your plants. Shredded Bark is a good choice for gardens that are growing rapidly. It slowly breaks down, adding nutrients to the soil, and its stringiness prevents it from washing away. Compost is ideal if you really need to build up the nutrients in your soil. However, it does not prevent (and may even encourage) weed growth like other types of mulch often do. Wood Chips have similar benefits as shredded bark. Although they are inexpensive, they do tend to discolor with age. Contact us at Outdoor Expressions to learn how our qualified landscapers can bring your gardens back to life. We always focus on making your outdoor space a place to remember.